David Warner has been praised for an act of sportsmanship while fielding for St Lucia Stars against Steve Smith’s Barbados Tridents. DAVID Warner may have failed once again with the bat in the Caribbean Premier League, but his match will be remembered for an act of sportsmanship in the field. The 31-year-old - serving a 12-month international and domestic suspension for his part in the Cape Town ball-tampering scandal - appeared to have taken an impressive outfield catch for St Lucia Stars against Steve Smith's Barbados Tridents on Saturday. His teammates began to celebrate, and the commentators applaud his handy piece of fielding which appeared to dismiss Dwayne Smith. But Warner swiftly gestured towards the umpire, signalling that the ball had hit the ground centimetres before his hands. The commentators praised Warner for the act, saying the batsman showed good sportsmanship to not claim the catch. 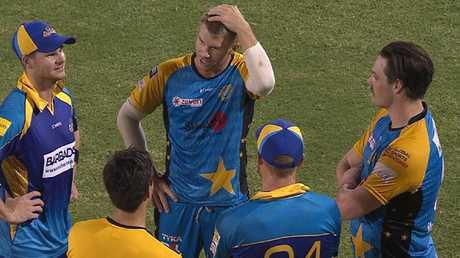 Warner took to the field moments after making his third duck in his last nine T20 innings. He edged one through to the wicketkeeper's gloves off the bowling of West Indies' Jason Holder on just the second ball of his innings. Warner and Smith were seen catching up after the match. But his failure didn't stop the Stars from posting a mammoth total of 226, courtesy of a showstopping century from Kieron Pollard off just 53 balls. He was supported by opener Andre Fletcher (80 off 52), and big-hitting cult figure Rahkeem Cornwall, who made a quickfire 30 off 11. Smith - playing in his second match for the Tridents - was given little chance to shine, coming in at five after Hashim Amla. He came to the crease in the 13th over of the chase, with his side needing a whopping 17.6 runs an over for victory. Smith fought bravely, taking his total to 28 runs off 15 balls following his opening match score of 41 against Guyana Amazon Warriors. But the former Test batsman sliced his 16th delivery straight to Kavem Hodge at deep point to leave his side needing more than 55 runs off the final two overs. The Stars eventually won the match as the Tridents fell short by 38 runs. Warner and Smith were seen shaking hands and enjoying a friendly chat together after the contest.